I can tell you from experience, nothing more volatile than a pissed off “local” woman. Miki Booth of Oklahoma is originally from here in the islands and she is letting people know what she thinks of Obama’s certificate of live birth. When the forum was over, tea partiers scrambled around a table to see and photograph her original documents. 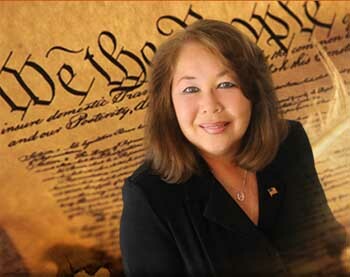 The woman, Miki Booth, originally from Hawaii, is running for the U.S. House of Representatives in Oklahoma’s second district as an independent constitutional conservative. She had presented original long-form birth certificates belonging to her son and husband, dated 1981 and 1949. Her husband, Fred, and son, Alan, were born at the Kapi’olani Medical Center for Women and Children in Honolulu, Hawaii – the same hospital declared as Obama’s birthplace in a purported letter from the president. “If he is going to claim he was born in Kapi’olani like my husband and my son, then I want him to show proof,” Booth said, explaining that a certification of live birth only shows that a live baby was born – and not necessarily in Hawaii. “What he’s given us perpetuates the mystery of what he’s covering up and gives us more reason to not trust him,” she said. 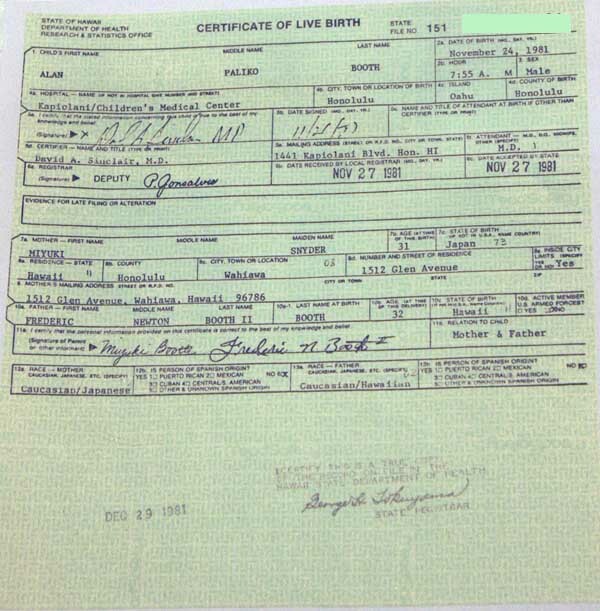 The basis of the controversy is that at the time of Obama’s birth, a birth certificate (or certificate of live birth) could be phoned in. There is no conspiracy behind Barry Soetoro becoming a US citizen besides his chances for a better life lay with US citizenship versus any other country. Check out these links for more information. Foreigners: Become A US Citizen; Get Your Hawaii Birth Certificate Here!!!! Miki Booth just happens to be a member of GOOOH. What’s that you ask? Read on, and then go join! “I believe in limited government, a free-market system, a strong national defense, states’ rights and our right to bear arms against a tyrannical government as our Founding Fathers intended when they wrote the Constitution,” she said proudly. Booth said the GOOOH system is a plan by Tim Cox of Liberty Hill, Texas, a man who spent his career creating systems for Dell and developed credit card readers for gas pumps. She said candidates answer 100 questions on how they would vote on particular issues. She said when the organization reaches half a million people who invest $100 each, there will be a $50 million pot to fund national campaigns for those candidates – $1 million in each of the 50 states. Even if GOOOH doesn’t make critical mass by reaching the 500,000 membership mark, Booth has every intention of continuing her fight for the House seat currently held by Rep. Dan Boren, a Democrat. For more information about Miki Booth, go to her site, here. This is exactly the type of person we need in Congress! As a proud member of GOOOH I am looking forward to seeing the 500,000 th member of this fine organization that will suport the right kind of candidataes. P.S. – Wouldn’t it be great if some present member of congress would be as brave as Miki Booth and demand these same documents? Never will that happen because they are all sheep. I too am a member of GOOOH and wish that I could run. As for a member of congress asking for the Occidental Records (nevermind the real BC) – dream on. I can think of no one I would rather have representing the people than you. If GOOOH can reach the critical mass it needs to lurch forward, I urge you to reconsider! And that would be the problem Grail. People like me who think outside the box have very interesting lives. My family and I wouldn’t live through a campaign. That’s the whole point, Diamond! We have to stop looking at that kind of crap in candidates and start looking at what they believe. 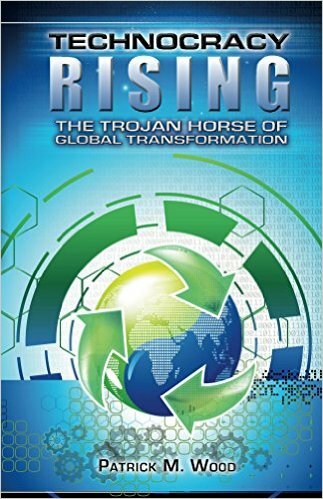 Look where the “conventional wisdom” has gotten us; not only so we end up with Ali Baba and his 544 thieves, but look at how many of them end up being convicted of crimes after we send them to elected office! I think someone with an interesting life would be much less dangerous, and if we want to save this Republic we all need to start thinking outside the pre-fabricated box! I ask this simple question: if a person is willing to commit to serving no more than 2 terms in elected office, how big a risk is it to vote for them even if we don’t agree with everything they’ve ever done? Besides, if we would exercise our Constitutional duties faithfully we could clean out the House every other year! So let me get this straight. 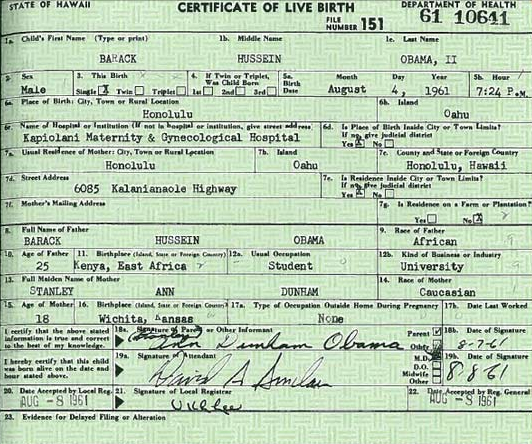 You’re saying that BOBAMA WASN”T born in the U.S.? Well Bill O’Riley SAID he was born here! And you all know that the great O’Riley KNOWS all!!!!……..NOT! Sarge!!! Do Not Get Me Going!!! You know how much I detest O’Reilly and think he is a total pantywaist with a secret tingle. Obama…. where is your long form birth certificate…hmmm, what are you hiding from the American people…and it has been established you never attended Columbia University… why are you concealing your records from us obozo? Maybe Ms. Booth could show her birth certificate? I mean she waves around her husband’s and her son’s, where is her? Presenting a LEGAL BC should be a pre-requisite for filing your intention to run for president. No more of this BS that we’ve been dealing with the past couple of years. I had read that some congressman had proposed this, but haven’t heard anymore about it. Does anybody know if this was true or only a rumor?